Katherine the Great » Blog Archiv » A weekend in pictures. I delivered the Rainbow Vanessa Socks to Turtle and was happy to spend some quality time with her clan. Knit socks also make great hats. I also had a lovely time playing Marco Polo in the pool with my brother and nephews and niece. The gray socks fit my niece; I was so pleased to find them a home with someone I love enough to give hand knit socks to….and it healed my heart to have them go to someone that knows and loves my dad (the intended recipient). The niece may have a future in sock modeling. Great socks, glad you found a deserving recipient.. Thanks! I could not have been more pleasantly surprised to find they fit her! I love those socks. A lot. A lot a lot. Thanks a lot. a lot! It makes a perfect hat! Glad that all the feet fit the socks. Thank you! 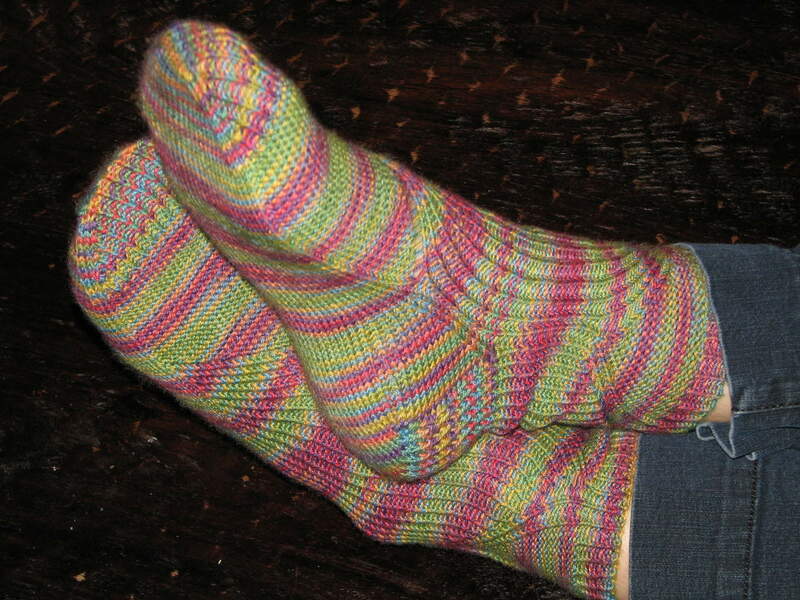 Who knew hand knit socks were SO versatile?! 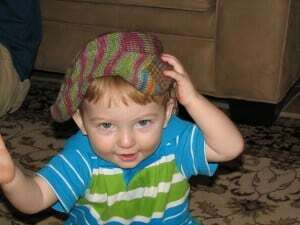 Well, now…if your knitted socks that pose as hats will make me THAT cute…I WANT A HAT. Carrie recently posted..My mother will now die happy because that crap of “I certainly hope you have a daughter just like you!” came true. Dear God did it ever. you can’t get any more cute. It’s so nice that both pairs of socks are in good hands, er, feet. It definitely looks like you might need to knit a third pair, because Turtle’s little guy seems to be a big fan! Michelle recently posted..Walk on the Wild Side. I asked for his foot measurements today. Yay! I thought the exact same thing about your niece and her excellent sock modeling abilities. Turtle Jr. loves everything his Auntie Kate makes. Kid recognizes quality when he sees it! You already know I love my new socks! The colors make me Happy Happy Happy! and Auntie Kate loves him! I’m in sock knitting envy! Love your socks. Last year I gave socks for Christmas presents … very well received. I hope to give a few for Christmas presents, but sometimes I can’t wait and they are given “just because” (one giftee agreed to give them back and let me wrap them up again for Yule).